The Alderaan Trail reimagines The Oregon Trail an even longer time ago in a galaxy far, far away. Classic computer game The Oregon Trail tasked players with gathering supplies and travelling through the American frontier in search of a new life in the newly-founded territory of Oregon. The path was fraught with danger, and players were constantly in danger of running out of food, being attacked by animals, or getting sick. Fording a river could destroy your wagon, and dysentery would almost inevitably claim at least one of your family members. Could you ford a river in an X-Wing? Did Luke Skywalker kill those womp rats for food? What killed more, Stormtroopers or dysentery? While it's fairly likely that you have never considered these issues, at least one Star Wars fan has. Matt Marchini's Alderaan Trail art gallery combines The Oregon Trail and Star Wars with delightfully entertaining results. Marchini's gallery of screenshot mockups does give us a tantalizing look into what would be possible in a Sci-Fi take on Oregon Trail, replacing wagon wheels and gun pellets with power converters and Bantha fodder. Instead of hunting for deer, you might have to slay a few tauntaun. 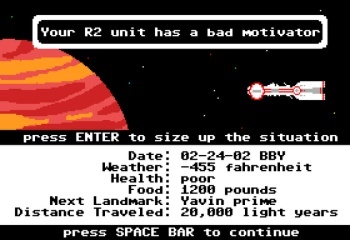 Watch out - a bad motivator on your R2 unit could mean death. The Alderaan Trail gallery really makes me crave a fully-playable game. Anybody looking for a good project?